“He’s like Jesus,” says actor Zahn McCarnon, in Denver to promote TNT’s new miniseries Into the West. 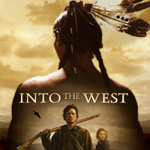 After screening the first of six episodes, I can tell TNT’s new mini-series Into the West isn’t just another clichéd western with cowboys and Indians, but an accurate interpretation on the West. The series focuses on a particular pioneer family and a Native American family during the years 1825 to 1890. Michael Spears (Dances With Wolves) and McCarnon (Skins) play two brothers of the Lakota, a peaceful tribe that experiences an epic cultural clash with the settlers. Episode One: Wheels to the Stars sets the stage with powerful dramatic intensity and a clever style. The set design is impressively handsome, while the landscapes are on an epic scale. From towering rocky mountains to open prairie, the gorgeous cinematography sweeps you away from the living room couch and places you right in the heart of the old west. Just from watching the historic scenes containing the Native American lifestyle and mythology, it’s crystal clear that the research has been done very, very well. Although the authenticity may be a bit tedious at times, the realism will certainly impress and interest most viewers. Spielberg hopes that the series will someday be used in the schools as an educational tool, and the two actors agree. “I think students will learn much more from this than from their books. I hope this can inspire them to want to learn more and to give them a deeper appreciation for what their ancestors went through to make this country what it is. I want my grandkids to someday watch this movie and learn from it,” explains Michael.